ECM form fungal mats in the surface soils of Douglas fir (Pseudotsuga menziesii) forests and probably other coniferous forests. The mats contain higher microbial biomass, with two to three times more soil mesofauna (collembola, mites, and nematodes) feeding on them (Cromack et al., 1988). The fungal mats play an important role in buffering against iron and aluminum activity in the acidic soils on the west slope of the Cascade Mountains in the Pacific Northwest of the United States (Entry et al., 1992). As iron and aluminum activity in soil increases, calcium oxalate crystals formed by the fungal mats dissociate, releasing calcium and chelating the iron and aluminum. Entry et al. 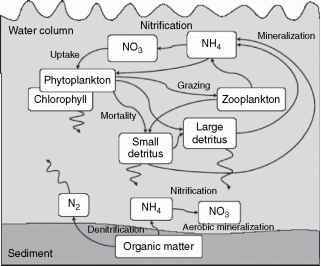 (1991) also measured greater litter decomposition rates and greater mineralization of nitrogen and phosphorus in ECM mat soils. Alternative methods for determining ECM fungal community makeup have been developed using molecular techniques. Landeweert et al. (2003) used a basidiomycete-specific primer pair (ITS1F-ITS4B) to amplify fungal internal transcribed spacer (ITS) from total DNA extracts of the soil horizons, followed by an amplified basidiomycete DNA cloning and sequencing procedure, to identify the ECM fungi present. The soil samples were from four distinct horizons of a spodosol profile, under coniferous (Norway spruce [Picea abies] and Scots pine [Pinus sylvestris]) vegetation. By identifying basidiomycete mycelium in the soil, the ECM fungal community was analyzed in a novel fashion (ECM root tips were excluded from the analysis). Landeweert et al. (2003) sampled from the O layer (0-2 cm deep); the E horizon (3-18 cm); the enriched eluvial, or B horizon (18-35 cm); and the parent material, or C horizon (deeper than 40 cm). They found 16 of the 25 total operational taxonomic units (OTUs) exclusively in the deeper mineral soil, or B horizon. The authors suggested that these distributions might be the result of somewhat higher amounts of carbon and a higher pH existing deeper in the profile. This analysis demonstrates the need to consider the full suite of ECM fungi present, and is a cautionary note that the entire profile should be considered when determining species richness in a given site. There are other kinds of mycorrhiza—most notably Ericaceous mycorrhiza—which have some traits in common with ECM and AM. Ericaceous mycorrhiza are symbiotic with many heathland plants; Rhododendron and Kalmia spp. are often infected with Ericaceous mycorrhiza (Dighton and Coleman, 1992). The fungus normally involved in forming the infections is the ascomycete Hymenoscyphus ericae or its anamorphs, and significant amounts of chitin-N can be transferred to the host plant (Kerley and Read, 1995). Ericaceous mycorrhiza are noted for the ability to facilitate direct uptake of organic nitrogen in low pH environments, and some of them produce proteases to enhance the nitrogen uptake without going through any external mineralization in the soil solution (Bending and Read, 1996). As may often be the case with residues derived from ericaceous sclerophylls, the essential elements (nitrogen and phosphorus) will be masked by skeletal materials, namely lignin or its breakdown products. In these circumstances, the ability of the mycorrhizal fungus to produce lignase or phenol oxidase activities and thus expose the nutrient-containing substrates would be just as important as production of the enzymes (e.g., phosphatases and proteases) that are directly involved in nutrient release. Also see comments in the section on future directions in mycorrhizal research at the end of this chapter. For information on these, and other less-common mycorrhiza, refer to Allen (1991, 1992), Read (1991), and Smith and Read (1997).